The UK government published its latest National Security Strategy and Strategic Defence and Security Review in November 2015. This document identifies the real security threats we face today, based on ‘a judgement of the combination of both likelihood and impact’. The tier one threats listed include terrorism, cyber-attacks and a health crisis. A nuclear attack is not listed here, but is rather placed in the second tier. This quite sensible analysis is not reflected in the government’s rhetoric, when it claims nuclear weapons are vital for our security. So what are the actual problems which are facing us today? International terrorism from groups such as the Islamic State in Iraq and the Levant (ISIL) and Al Qaida present the most high profile threat today, even if the total number of deaths from terrorism has fallen from its 2014 peak. The UK’s current terrorism threat level is ‘Severe’, meaning that a terrorist attack on the country is highly likely. And with the end of the ISIL caliphate, the return of foreign fighters in Iraq and Syria poses a complex problem that urgently needs addressing. There is a clear consensus that climate change constitutes a serious threat to global security. Senior military figures have formally warned that global warming is the greatest security threat of the 21st century. Climate-related disasters such as food insecurity, drought and rising sea levels are major causes of mass migration flows, with Friends of the Earth estimating that there are currently 40 million environmental refugees, a figure that is expected to continue to rise substantially over coming years. This increases the challenges faced by states in providing the conditions necessary for human security, with increased pressure on public services and infrastructure in addition to challenges of integration. Climate change is overwhelming disaster-response capabilities and creating and exacerbating humanitarian disasters, political violence and state instability. The UK is facing an increasing threat of cyber-attacks from hostile states, terrorist and criminals, with the internet representing a critical axis of potential vulnerability in today’s internet reliant world. Cyber security embraces both the public and the private sector and spans a broad range of issues related to national security, whether through terrorism, crime or industrial espionage. Public health has come to be regarded as a security concern for governments with the safety and well-being of citizens a central concern, with a number of factors combining to create an increasingly unstable situation in the realm of public health. These include the increasing physical interconnectedness of the world, weak public health services and lack of infrastructure and the rise of drug resistance. The combination of these factors has resulted in a situation where infectious diseases are now able to spread geographically at a much faster rate than ever before. There is also clear evidence that infectious diseases are emerging at an unprecedented rate, with the WHO confirming that since the 1970s newly emerging diseases have been identified at the unprecedented rate of one or more per year. This increase in both the occurrence and spread of microbes with the potential to cause pandemics is placing pressure on existing health services, creating scientific challenges and has the potential to impose enormous economic damage to states. Experts are increasingly questioning the technological viability of Trident, as developments in underwater drone technology could render the system obsolete. The vast amounts of money being poured into drone technology means that eventually Trident will be both detectable and targetable, meaning the government is wasting money on weapons with built-in redundancy. Hostile submarine detection is generally undertaken by staffed ships and aircraft currently. Manpower is a precious resource and so only a limited number are searching for adversaries’ submarines at any one time. Viable underwater drones mean that it becomes feasible for the number of machines looking for a submarine to be multiplied many times. This adds up to a ‘swarm’ effect with possibly hundreds, or thousands, of machines able to search together, covering vast areas. The Ministry of Defence (MoD) has even launched a competition to see who can come up with the best way to develop drone swarms. The ‘Many drones make light work’ challenge offers the opportunity to win grants to develop the first generation of drone swarms for use in war. Drones can even be launched in bad weather conditions which would usually be too dangerous for a staffed ship or aeroplane. A current limitation on the use of drones is that their time in operation is relatively short, but here also we see developments with NATO thought to be developing gliding underwater drones that sweep up and down thereby generating the power they need for their tasks. Other drone makers are ensuring their product can charge itself using solar power. Drones can carry a range of sensors, as do conventional anti-submarine warfare technologies. And these sensors are improving too. As well as getting smaller and cheaper, sensors are getting better at detecting submarines from further away. A network of drones successfully detected, reported and tracked a live submarine in a Royal Navy demonstration in October 2016. If the Trident submarines were to become easily detectable, they of course lose their advantage. Former Defence Secretary Lord Browne warned in 2015 that Trident could be rendered obsolete by cyber-attacks. He went on to say in the same interview that unless ‘weak spots’ were protected, there was ‘no guarantee’ of a reliable nuclear system. Common sense would suggest that the fact that Trident relies on various computers and networks means there is at least a possibility of an adversary affecting the running of the system. Especially considering that it uses the very common, and therefore well-known and understood, Windows for Submarines software, based on Windows XP. The government tries to reassure us that Trident is safe from hackers because it is ‘air-gapped’ from the internet, but many hackers in the world today are proficient in jumping similar ‘gaps’. Britain’s nuclear weapons are connected to other computers and servers for various reasons, for example to upgrade with new information or to receive weather reports. The Atomic Weapons Establishment (AWE) near Reading, where Britain’s nuclear bombs are made and serviced, even uses a public cloud service to store its data. AWE has refused to answer whether this will include classified information. The worst case scenario is a hostile, cyber take-over of our nuclear weapons system. This is more likely to succeed if an adversary manages to install a malware programme during the building phase that would activate at a later date. As a lot of equipment for Britain’s submarines is produced outside of the country – in China – it is possible to see how this could happen. Another cyber-threat is the possibility of another state or organisation hacking into communications to the submarines, and suggesting a nuclear attack was imminent to a sufficient degree to confuse those on board. 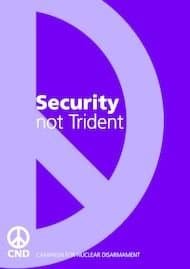 The government does have high security measures in place to attempt to counter these threats, but with 250-350 serious cases of cyber-attack against NATO countries each wee, the risk of just one being successful and accessing Trident is not unthinkable. Many supporters of Trident claim that nuclear weapons keep the peace by acting as a ‘deterrent’. This is the false belief that we will dissuade an ‘enemy’ from attacking if they know that we could retaliate with nuclear weapons. During the Cold War, the United States and the Soviet Union may have avoided a direct war – and whether or not that was anything to do with nuclear weapons possession is unknowable – but that didn’t prevent their involvement in wars in Vietnam, Korea, Afghanistan and elsewhere. The nuclear powers have been involved in hundreds of wars since the atomic bomb was first invented in 1945. Having nuclear weapons did not defend France from terrorist attacks, or the US from 9/11 or the UK from the July 7th bombings. In fact, replacing Trident might encourage more countries to get nuclear weapons and so increase the danger of nuclear war. If countries like the UK and others insist that they need these weapons for their security, other countries will come to the same conclusion. Unstable or isolated states are more likely to seek nuclear weapons in this context. Their behaviour is often the result of complex regional problems or of a history of hostile external intervention or exploitation. These issues are best resolved through diplomacy and political negotiation on the basis of equality and mutual respect – not on the basis of having the capacity to destroy them many times over. Some MPs voted in favour of replacing Trident on the false belief that Britain’s nuclear weapons are a symbol of the country’s independence and ability to act alone. But Trident is neither politically or technically independent. Most of the system relies on technical support from the United States. The missiles are leased from them with the Trident submarines having to regularly visit a US base for their maintenance; the UK warhead is a copy of the US one, with some components directly bought from Washington. It is inconceivable to imagine a British Prime Minister firing a nuclear missile without permission from the American President, and the rest of the world knows this. It’s also important to note that Trident has been assigned to NATO since the 1960s, meaning it could be used against a country attacking – or threatening to attack – one of the alliance’s member states. NATO also refuses to implement a no first use policy. Does anyone really want our nuclear weapons to be used in a proxy war which might not even be directly relevant to Britain and its security? If we valued independence of action as the reason for retaining nuclear weapons, the UK would not engage in the Mutual Defence Agreement and depend so heavily upon the US for the procurement of our nuclear systems. This dependence takes away the only remaining strategic justification for an independent nuclear deterrent. Looked at from an Alliance-wide perspective with a pro-nuclear deterrence agenda, it makes more sense for all to delegate the ultimate nuclear threat to the Americans, freeing the British and French to contribute resources that are valued as a more effective contribution – capabilities like intelligence, cyber security and special forces. It will always be a government’s priority to keep its citizens safe. But what is true security in the 21st century? As the world becomes more inter-linked than ever before, it is becoming the norm to cooperate with other states on the challenges facing us, rather than battle against each other. The actual security threats identified by the government and in this report are complex and will not be solved overnight. But Britain does have the capability to overcome them. What the country does not need is to spend billions replacing Trident. Disarming could not only provide political leadership to the rest of the nuclear-armed states, but would be a practical guide for how to do it, a blueprint for the rest of the world drafted by our experts and politicians. Britain disarming could even provide impetus to the United Nations’ plans for a nuclear weapons-free world. The United Nations adopted a historic international treaty banning nuclear weapons in July 2017 and will enter into force when ratified by 50 states. 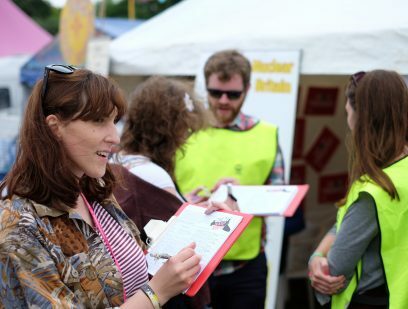 122 countries supported the treaty, but the UK government refused to participate in the negotiations and even issued a hostile statement, while maintaining that it shares CND’s goal of a nuclear weapons-free world. CND is lobbying the British government to sign the treaty and work towards the global elimination of nuclear weapons. This would be the first step in Britain rethinking its approach to security with discussions on our membership of NATO and an end to our involvement in foreign wars to follow.